18th President of the United States (1869–1877), with Schuyler Colfax (186–1873) and Henry Wilson (1873–1875); Union and Army four-star General (1839–1854, 1861–1869). “United States/Grant, Ulysses Simpson” by Alexander Johnston in Encyclopædia Britannica (9th ed., 1888). 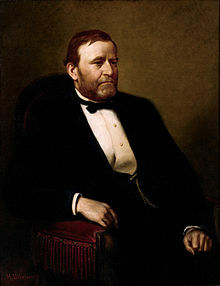 Horace Porter, “Ulysses S. Grant” in The Presidents of the United States, 1789-1914, 1914. The text for this is based almost word-for-word on the Appletons' Cyclopædia of American Biography article. The illustrations are quite different. “Grant, Ulysses Simpson” by Joseph McCabe in A Biographical Dictionary of Ancient, Medieval, and Modern Freethinkers, 1945.